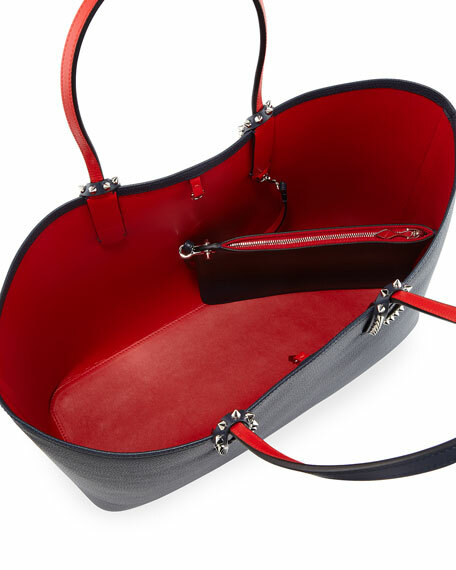 Christian Louboutin east-west tote bag in grained leather. Flat top handles; spiked tabs at base, 8" drop. 12"H x 19.3"W x 5.5"D.
"Cabata" is made in Italy. 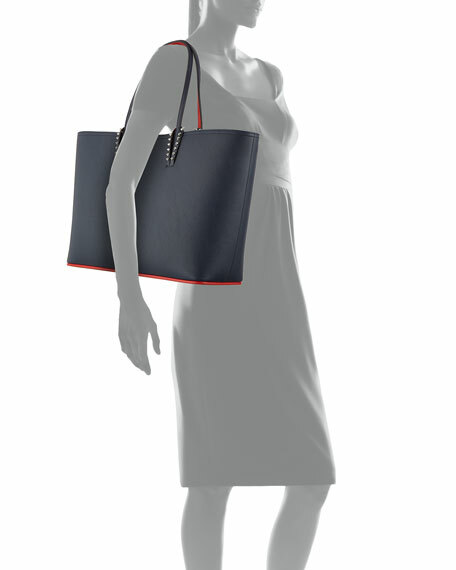 Bottega Veneta tote bag in signature intrecciato woven napa leather. Signature brunito hardware. Chain and leather shoulder straps, 10" drop. Bottega Veneta tote bag in signature intrecciato woven napa leather. Signature brunito hardware. Chain and leather shoulder straps, 10" drop. Open top; zip compartment divides center. Interior, suede lining; one zip and two slip pockets. 10"H x 15.5"W x 6"D. Made in Italy. Coach 1941 smooth calf leather tote bag with golden hardware. Chain and flat top handles with hanging logo tag. Recessed, extended zip top closure. Exterior, front compartment with logo turn-lock closure. Interior, logo-print lining; one zip pocket. kate spade new york pebbled leather tote, featuring 14k light gold plated hardware. Flat top handles, 3.7" drop. Zip top. kate spade new york pebbled leather tote, featuring 14k light gold plated hardware. Flat top handles, 3.7" drop. Zip top. Interior, one zip pocket, one slip pocket, one center zip pocket. Polyester lining. 11.6"H x 13.6"W x 6.3"D. Imported.